“In the late 50s and early 60s, Steve and Gayle Henson’s dude ranch near Santa Barbara California was a favorite of weekend visitors wanting to enjoy the natural surroundings. The ranch restaurant’s menu often included salad with a dressing created by Steve from a dry mix of herbs and spices, mayonnaise and buttermilk. The dressing was so popular it soon became the only salad dressing served. A visitor to the ranch took a batch of the dressing back to Hawaii for a large party he was hosting. A few days later, the guest called wanting more. The partygoers had gone wild over the Ranch Dressing. Henson thought he might be on to something big. Steve Henson started manufacturing and marketing the powdered mixture. Within months, twelve people were helping him mix the dressing at Hidden Valley. By 1970, the dressing had reached over 30 countries. And many others got involved: famous people, activists and unknowns – all trying to keep the prisoner from being the first woman executed in Texas since Chipita Rodriguez was hung from a mesquite tree on Friday, November 13, 1863. Research Chipita Rodriquez on the internet –it’s really interesting. And you’ll also find the only other woman executed in Texas, – well actually she was just a girl – they think she was 14 or 15. But Jane Elkins, a slave, was convicted of murder, and hanged on May 27, 1853 – becoming the first state-sanctioned killing in Texas history. Chipita Rodriquez was a Mexican and Jane Elkins was black, but our prisoner wasn’t Mexican and she wasn’t black – she was a very pretty, telegenic, young white woman who had done the jailhouse conversion thing and witnessed regularly now for Christ, talking up the lord to the other Death Row gals and the guards. And, well, she was just a good person now. She loved the lord and the lord loved her back, and she was so so sorry about the killings. There was nothing she could do to bring the victims back; but you could tell she really meant it when she said she was sorry. She had become a good Texas Christian woman. But the thing is, she never said that. Not once. Never on Larry King Live. Never anywhere. Governor Bush refused to intervene and stop the execution. Bianca Jagger returned to Manhattan and a few years later she’s back in the news. She’s taken up another fight, this time against mold. Mold in walls, under floorboards, in carpeting, and behind the new kitchen cupboards she just paid to have installed. The cupboards have frosted glass fronts and are lit from the inside – “top of the line” she says. But there is this mold everywhere, and it has caused her very serious health problems, coughing, rashes, interrupted sleep. Her allergies are killing her. And there’s Bianca Jagger on TV again. This time she’s on “Celebrity Justice” gesturing toward the mold on the ceiling of her walk-in closet. “Think of the people without resources.” She says. “People without access to good lawyers.” She’s preparing to take the co-op board to court. The inmate – the offender, the prisoner, the converted condemned – was executed on February 3, 1998. Her requested final meal was: a banana, a peach, and a garden salad with Hidden Valley Ranch Dressing. This is meal number 145 on the list of final meals from the Texas Department of Criminal Justice website. And This is Meal Number 113 – April 16, 1997: Bowl of butterbeans, mashed potatoes, onions, tomatoes, biscuits, chocolate cake and Dr. Pepper with ice. This is Meal Number 237 – December 5, 2000: 2 grilled cheese sandwiches, French fries, ketchup, 2 boiled eggs, 2 cinnamon rolls with icing, 2 cans of grape juice with coffee. On Saturday July 22, 2008 in Lucky Pierre member Jeff Kowalkowski’s family kitchen in the Logan Square neighborhood of Chicago. We, Lucky Pierre, prepare meal number 145. Banana, peach, and garden salad with Hidden Valley Ranch Dressing. This is Meal Number 193 November 16, 1999: Meal declined. THE FINAL MEALS PROJECT: Each final meal before execution, as requested by a Texas Death Row inmate and published by the Texas Department of Criminal Justice on its website, is recreated by Lucky Pierre. A volunteer is videotaped eating the meal. The video is a black and white overhead shot with the plated meal centered in the frame. The food is the focus of the video, what is prepared, what is consumed. The volunteer’s face will remain unseen as much as possible. Each volunteer has approximately 25 minutes to eat the meal. Each volunteer can choose whether to actually eat the meal or not, but must sit with that meal for the duration of the taping. 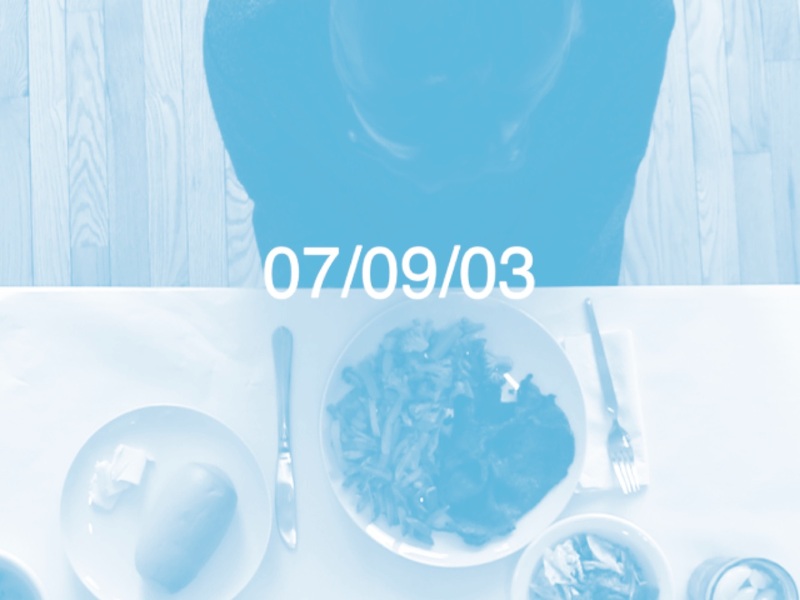 The final video is a single unedited shot, with, at the beginning of each segment, a title with the date the meal was eaten by the prisoner: October 14, 1999. At the end of each segment, a title shows the requested meal: BLT with pickles and onions, French fries, one pint of butter pecan ice cream and a Coke. The name of the executed does not appear on the video. When Lucky Pierre began this project in July of 2003 the list published on the Texas Department of Criminal Justice website listed 309 meals. Number 309, the most recent entry at that point had been prepared and eaten by the prisoner on July 24, 2003. Chicken fried steak, gravy, French fries, ketchup, salad, blue cheese dressing, iced tea with lemon, two sodas, rolls and butter. The Prisoner was executed on July 24, 2003. But the Final Meals project is different. At the beginning we didn’t quite understand the enormity of the project. The monumental nature of the accumulating meals and dates and people, at times, become overwhelming and frankly, quite sad. And the expense of producing outside an institution becomes prohibitive, so we’ll decide to push the project to the side for few months, or a couple years, take a few breaths before beginning again. So – ultimately when we finish. If we finish. When we finish. The piece will consist of over 130 hours of videotaped meals. What do we do with 130 hours of videotaped meals? Who besides us would want to watch 130 hours of people eating. We toyed with the idea of never showing the videos. But we have shown the videos. We dream of a multi-channel video installation on a single row of 30 – 40 monitors. 310 meals looping over and over. Or projected big – very big – on the side of a building. A member of the group approached Target about possibly projecting on the side of their Chicago store. There was no response. A member of the group approached Chicago’s Museum of Contemporary Art about projecting on the side of their museum. There was no response. We began preparing meals and videotaping in late September 2003. Meal number 1: T-bone steak, French. fries, catsup, Worcestershire sauce, rolls, peach cobbler, and iced tea. To date we’ve taped 197 meals. On Saturday May 22, we cooked and recorded 24 meals. The final, final meal of that day was Meal 147 March 11, 1998: Old-fashioned cheeseburger, French fries with ketchup, chocolate cake, and two cans of Coke. Old-fashioned cheeseburger. This is where the project – after so many months and years now of buying food and editing videos and making phone calls and sending e-mails and burning DVDs – this is where the language and the ordinariness and the senseless hope in the hopelessness of these requests still sneaks up on us and punches us in the gut. Why an old-fashioned cheeseburger? When the condemned was asked to write down that final meal; asked to list the ingredients of this last state sanctioned gesture of bodily maintenance and comfort, the condemned could have written simply “cheeseburger.” But he wanted more. He wanted “old-fashioned;” one of the arsenal of potent modifying adjectives, the sentimental in marketing. Marketing that had worked, and continued to work to the very final of final ends. Hamburgers are the most requested final meal – variations with and without cheese, with extra cheese, double meat, extra onions, no tomatoes, the works. “Give me the works.” The hamburger as ideal and idealized form. The hamburger as memory – a specifically American memory – and of course as comfort. But this request is for an old-fashioned cheeseburger – like mom used to make, or like mom could never quite make. And what about mom? Mom is always nearby in this project. She’s peeking over our shoulders as we cook. She’s in the flow of cooking advice from our volunteers – in the calls to our own mothers to ask how to cook liver and onions (the trick is to dredge the liver in flour seasoned with salt and pepper and a bit of cayenne). And then there’s mom sitting on the other side of the Plexiglas – in the receiving room, and later in the execution theater. The mother often of color, weeping, stoic, angry, continuing to plead innocence – or not. Often just a few feet away are victims’ mothers, with their own particular and heartbreaking hunger. And of course the state as mom, in the feminizing embrace of food. And soon after, the state as dad. The state sooner or later always turns out to be dad. Many of the prisoners want Dr. Pepper. Because it’s the American south perhaps? Unsurprisingly though, even more want Coke, with many making a point to ask specifically for Classic Coke. No diet, or cherry coke or caffeine free. There’s also an abundance of requests for T-bone steaks. Baked potatoes, french fries, bacon and eggs. Quite a few BLTs and fish sandwiches. And tellingly many tortillas and tacos, mustard greens and fried chicken. And many want what is prohibited by the Texas Department of corrections. They know what’s prohibited, but ask anyway: a beer, a shot of whiskey, a pack of cigarettes. Bubble gum. Bubble gum for God’s sake. Prohibited. Please though. It never hurts to ask. Please. There are meals poignant and profound in their descriptive brevity. #10: One flour tortilla and water. #61: Cheeseburger, ice cream, water. #291. Cool whip and cherries. #62: God’s saving grace, love, truth, peace and freedom. #209: Justice, Equality, World Peace. There are the big meals. The meals crazy in scope, scale and combination. The meals that take a long long time to eat and make a big big mess for someone to clean up. #158: Twenty-four soft shell tacos, six enchiladas, six tostados, two whole onions, five jalapenos, two cheeseburgers, one chocolate shake, one quart of milk and one package of Marlboro cigarettes. Or # 271: Two 16 oz. rib eye steaks, one lb. turkey breast (sliced thin), twelve strips of bacon, two large hamburgers with mayo, onion and lettuce, two large baked potatoes with butter, sour cream , cheese and chives, four slices of cheese, one-half pound grated cheddar cheese, chef salad with blue cheese dressing, two ears of corn on the cob, one quart of mint chocolate chip ice cream, four cans of Cokes, four cans of Mr. Pibb. And then there is meal #248. June 26, 2001. One coconut, kiwi fruit juice, pineapple juice, one mango, grapes, lettuce, cottage cheese, peaches, one banana, one delicious apple, chef salad without meat and thousand island dressing, fruit salad, cheese, tomato slices – and one Chocolate birthday cake with seven pink candles and the date 2/23/90 written on top. and then we don’t take anything in – ever again. 25 minutes can be a long time to sit with the dead. So much can happen in 25 minutes. And for viewers of the piece – 25 minutes is a long time to watch someone eat. I hate America. I love America. And the volunteers who eat this food we’ve prepared? Some research the meal, the offender, the crime, the victims, the last statements of the executed – it’s all available on-line. Some volunteers are only mildly interested. Some don’t want to know. They sit and eat. Or don’t eat. Some are bored, some nervous, some become upset, some try not to move for 25 minutes. One or two cried. One fell asleep. One volunteer ate the final meal of a prisoner with whom she had had a pen-pal romance. She sent him money, bought him vouchers to use at the prison store, told him about her art projects, she was engaged to him for a little while. She traveled to Texas and talked to him through the little speaker. They had their picture taken – both bending at the waist towards each other, cheeks pressed together against the plexiglas, smiling. Some volunteers are happy to be eating a t-bone steak. Many ask if there are any vegetarian meals. Many want to know when they can see the video of themselves eating the final meal of a Texas death row inmate. I tried to find out more about the Hensens, what happened after they sold the Hidden Valley Ranch Dressing business. I have this vision of Steve Hensen, Jr., son of the inventor, inheritor of the ranch dressing millions. Steve Hensen Jr., during an especially memorable meal commits some horrific crime and ends up on death row. And I make a list for him – adding, crossing off, starting the menu again and then again. His final meal. His final pleasure – always situated in the body. Because what are we finally but bodies? But there is no Steve Hensen, Jr. I just made him up. And truly, people like the Hensens don’t end up on death row – only their products do. In early 2009 Lucky Pierre stopped cooking meals. Things change. Collaborators depart. Have kids. Get married. People get tired. And then there’s this constant making stuff. Making stuff can sometimes just seem like that – only that: making stuff. And do we really need more stuff? Perhaps we should just stop and leave this a fittingly unfinished monument to the perpetual hunger for comfort and revenge. On September 22, 2011 the State of Texas served its final requested meal. 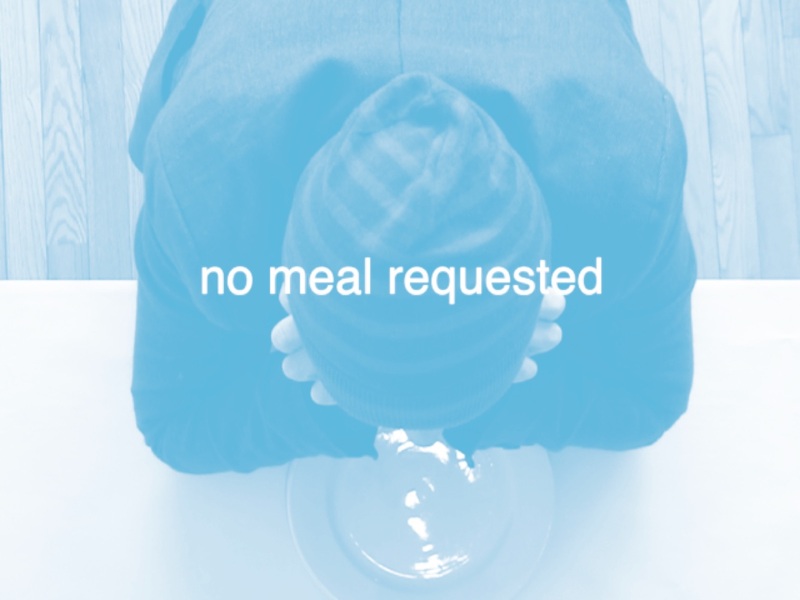 After that date inmates would no longer be able to choose a final meal. The Texas legislature decided it was a luxury the condemned didn’t deserve. As Texas State Senator John Whitmire (a democrat) said, “The victims never got to choose their last meals.” True. We haven’t been able to find out what the condemned will now be eating prior to their execution, though it’s probably whatever is being cooked that day. It will be nothing special. Except that it’s the last thing someone will ever eat. Ever. And that is special. The meal count when Texas banned the practice was over 310. Around that time we, Lucky Pierre, decided to continue. We decided being together was better than not being together. It almost always is. We decided to continue cooking and continue filming – and we will perhaps finish this thing. Inviting strangers and friends to eat a meal. Meal Number 157: September 9, 1998. Meal Declined.